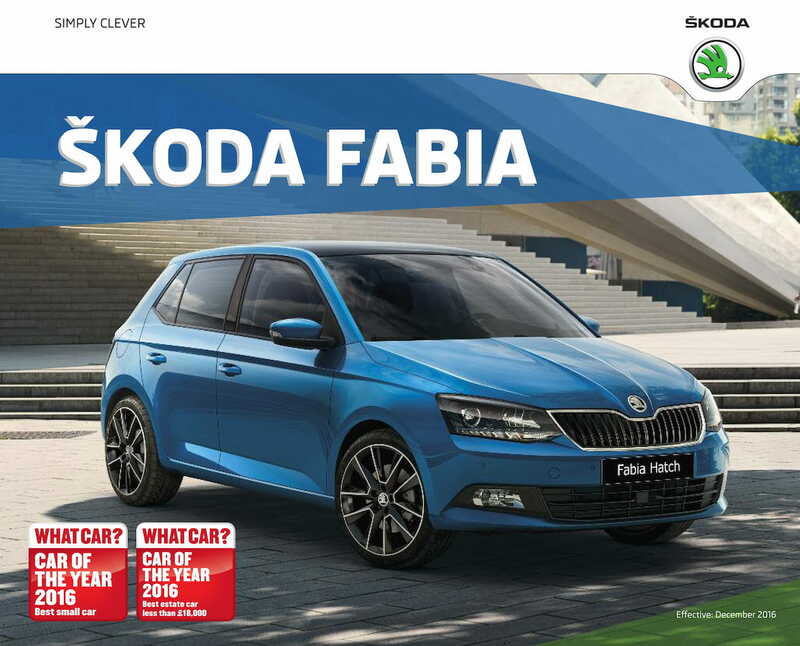 Sales brochure for the Skoda Fabia mini car, 11/2016 UK edition. Models include the Fabia S, SE, Colour Edition, SE L, and Monte Carlo. Exterior paint color options are listed as Pacific Blue, Candy White, Corrida Red, Denim Blue metallic, Moon White metallic, Black Magic pearl effect, Cappuccino Beige metallic, Topaz Brown metallic, Brilliant Silver metallic, Quartz Grey metallic, Rio Red metallic, Race Blue metallic, and Rallye Green metallic. The Monte Carlo also includes Laser White and Meteor Grey. Brochures are presented for research use only. Company marks, emblems, and designs are trademarks and/or service marks of Skoda.